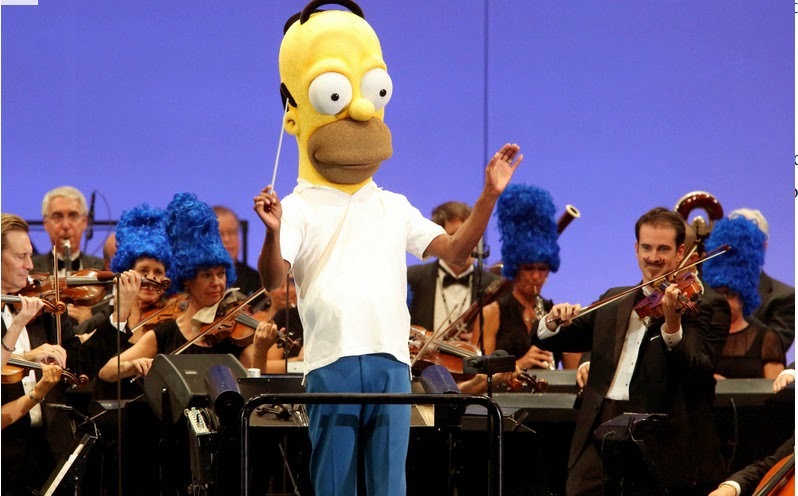 The Hollywood Bowl Orchestra, which featured several members wearing tall, blue Marge Simpson wigs, performed as classic clips from the show’s past 25 seasons. Those characters are performed by three actors – Nancy Cartwright, Yeardley Smith and Hank Azaria – who hosted the world premiere of “The Simpsons Take the Bowl” at the legendary concert venue Friday. The program featured music, stars and reminiscences from TV’s longest-running scripted show. The Hollywood Bowl Orchestra, which featured several members wearing tall, blue Marge Simpson wigs, performed as classic clips from the show’s past 25 seasons played on big screens above them. The 26th season of “The Simpsons” begins Sept. 28.